I am not the biggest fan of running in cold temperature but realize that it needs to be done from time to time. I always overdress and die of a heatstroke a mile into my run. I can never seem to find the right combination of running hat, gloves, jacket, etc. On this day, I was in a hurry to get outside and do a quick run before it got dark and started raining. 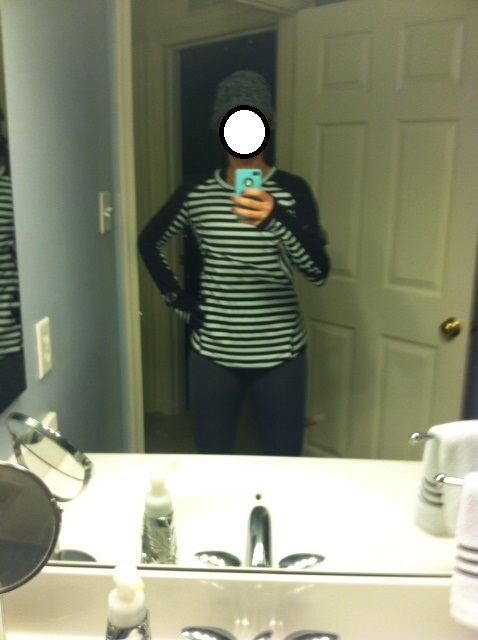 It was only at the end of my run did I actually look at myself and start laughing at my outfit. In my head, I imagined myself to be one of the outdoor runners in Nike or Lululemon ads. I’m not. Not even close. This is why I thought I’d share with you this monstrosity of an outfit. And my face post run is not cute so I had to edit that out. Boy, I can’t wait for spring when shorts and a tank top are all I need. What do you wear on your outdoor winter runs?